Jerry Kreinik: an icon, a master, an innovator, and my dad. He had intuition about products, amazing research abilities, and futuristic talents which he taught to me and my brothers as we grew up. He had a natural curiosity about all things; he would always ask “what if,” always try new things - especially foods - and always ask questions and listen. He encouraged us to be curious, be creative, to seek and to learn. When I chose to go into the family thread business, I learned from him about machinery, fibers, yarns, sales, product testing, inventing, developing - and was infected with his passion. I will miss my dad. Even though he was 96, we would still talk about new ideas, new concepts and how to make products better. I am proud of what he did and how he affected the industry. Who would have thought that a simple textile chemist when passing would have condolences sent from around the world? I am so proud of this man whose ideas made a real difference. Thank you all for honoring Jerry and my family with all your wonderful stories, thoughts and prayers. My mom, his wife of 66 years, is so proud that she met and married the right guy. They had a lifelong love affair with textiles, materials and each other. Jerry M Kreinik passed away at his home surrounded by his family on Wednesday March 23rd at the age of 96 years. 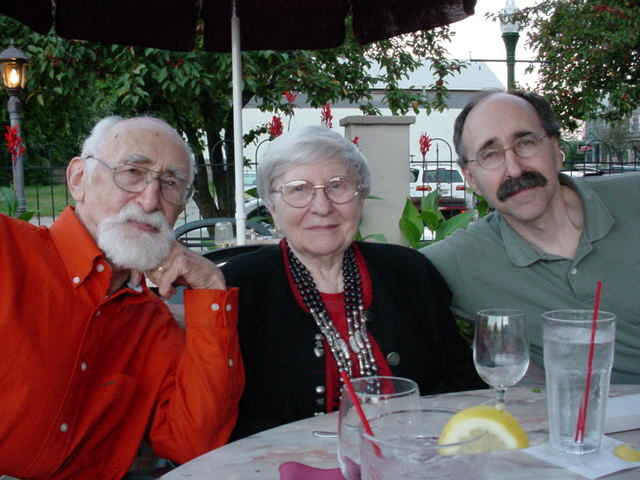 Jerry was born in 1915 in New York City to the late Isadore and Sarah Kreinik. He graduated from NYU and was a WWII veteran. Jerry studied textiles, chemistry, law, engineering, loved reading, classical music, being informed, and arguing points of interest. Jerry was a blue sky thinker, an inventor, entrepreneur, lecturer, futurist, loving husband, father, and grandfather, living a full and eventful life. Jerry’s influence was felt by those he met. 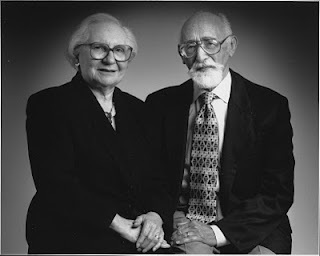 Using his imagination and creative juices and helped along by Estelle, his wife of 66 years, Jerry developed industrial standards of excellence within the needlepoint and cross stitch industry throughout the world. His moniker became a synonym for excellence. During his unique life, he worked at the Brooklyn Navy Yards developing textiles used for submariners and polar explorers, advanced the science of zippers, fasteners and buttons working on the creative team developing the “D” ring used by millions today, and established sizing for woman’s clothing. He taught the first class in plastics in the 1950’s at Brooklyn College in NY, designed dustless charcoal used by millions today. Along with this, he advanced the innovation of foam plastics, structural plastics and laminates. In 1971, after being released by Borg Warner, during the great firing, he and his wife Estelle began their trek into the hand-needlecraft industry during its infancy. Working with nothing but their knowledge of textiles, plastics, art, furniture, and materials, they developed a reputation for originality and superb products. Using materials that had never been contemplated, they developed lines of soft, usable craft yarn products in silks and metallics that felt good to the touch. With their little business, they were able to travel the world, see the beauty of this small planet, and influence the industry. Their business grew. They were recognized by The National Needlework Association for Excellence in the Industry in 1994. In 2012, Kreinik Mfg. Co, Inc., a Parkersburg business, will celebrate its 40th anniversary. Literally millions of people around the globe have and continue to enjoy the results of Jerry’s efforts in creating the materials used in needlecrafts and other textile arts and fashion. His family enjoyed his love of nature and learned how to recognize birds and trees, stars and cars; learned how to patiently use a variety of hand tools to create beautiful objects in wood, metal, and clay. 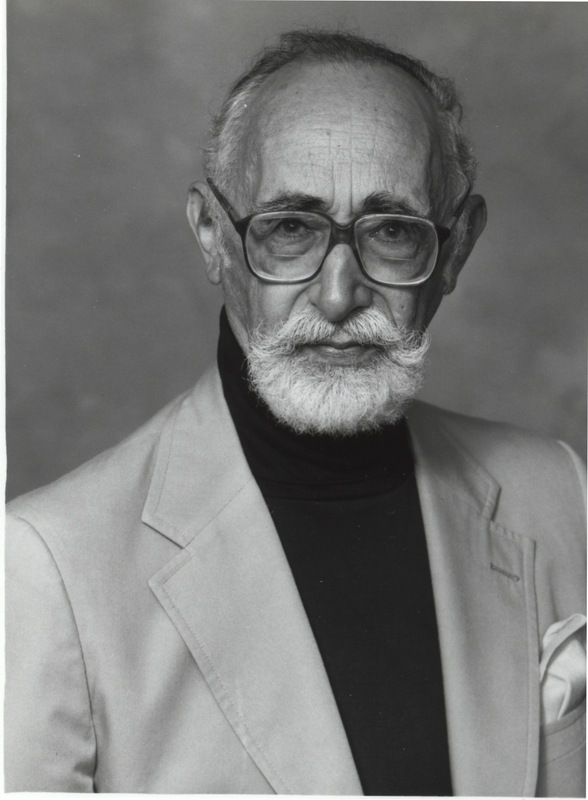 He contributed his time and funds to a number of community groups including Temple B’nai Israel, the Friends of the Parkersburg Public Library, and Parkersburg Art Center. He is preceded in death by his parents, sister Shirley, and brother in law Ted Gaynor. Services will be at Vaughn’s Funeral home on Sunday March 27 at 2:00 P.M. There will be visitation an hour before the service. Internment will be at Mt. Olivet. Jerry loved education and libraries, if you would like to make a donation in his honor, please consider the following: Temple B’nai Israel Parkersburg, the Parkersburg Community Foundation, The Parkersburg Public Library, Parkersburg Art Center, and Amedisys Hospice Services of Parkersburg. 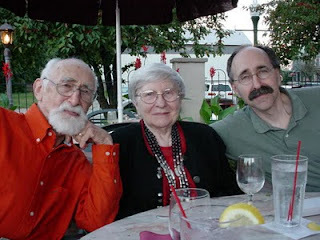 Needlework friends and family, Mr. Jerry Kreinik has been in declining health and appears to be in his final days. Please keep the family in your thoughts at this time. Jerry and Estelle started Kreinik Manufacturing Company nearly 40 years ago, and their son Doug continues to run the family business. If you have any stories or thoughts to share about Jerry, please do so - we would love to hear from you. Email us at info@kreinik.com. The official start of the 2011 Bookmark Challenge is Thursday, March 17. This community focused campaign runs until April 28. 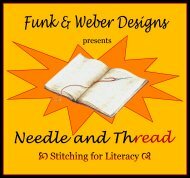 The program is an easy way to share a love of needlework and encourage people in literacy programs at schools, community centers and libraries. While the program culminates in April during Children’s Book Week, past recipients of stitched bookmarks include people of all ages, from children to seniors, many of whom want to learn how to stitch after receiving their handmade gift. Visit www.stitchingforliteracy.com for information on how to get involved. This is a short and sweet blog post about a blog post. 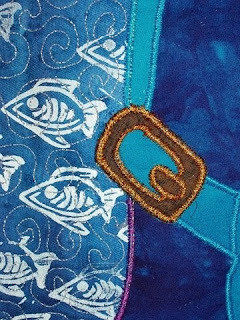 Designer Andrea Stern has been having fun doing some quilting with Kreinik threads. Click here to see her blog posting titled "Step-by-step". Andrea has several detailed images and describes how she put this together.